Personalized classic sunglasses – blue makes a very powerful promotional tool for advertisers who wish to keep their business messages in limelight. This sunglass can be distinguished easily from the lot due to its very simple, still electrifying appearance! White colored frames and darker lenses – can make it appear dapper. It accentuates the personality of a person wearing it. 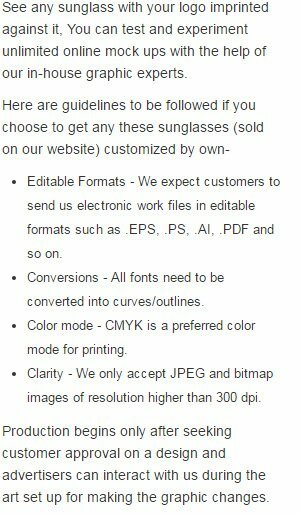 Promotional classic sunglasses – blue are largely ordered by marketers working in healthcare, fashion, luxury, hospitality, travel & tourism sectors. People who receive it as a gift may treasure it for long time because they know that it goes well with their all attires. Custom classic sunglasses – blue can be favored for business gifting during marketing events, community events, social events, and other joyous occasions where mass participation is expected. Imprint Area: 2" X 3/8".